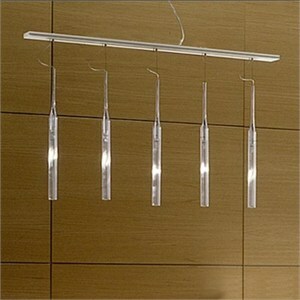 5 light linear pendant. Pyrex flutes are suspended from a sandblasted plexiglass plate. Canopy in satin finish steel. - Dimensions 39.4"L X 3.2"W; equipped with 78.7" wire. - Uses 5 X 35W 12V G4 bi-pin halogen lamps (not included). Magnetic transformer.